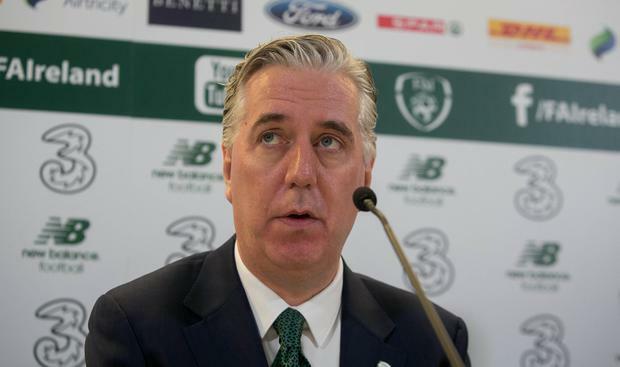 The Football Association of Ireland (FAI) has refused to clarify if CEO John Delaney will attend an Oireachtas committee hearing next month. The FAI is due before the Oireachtas Joint Committee on Sport next month in a long-planned meeting. The hearing will now see the FAI face questions on a €100,000 bridging loan given by the CEO to the association in 2017. Last night the FAI said it was willing to meet Sports Minister Shane Ross and Sport Ireland, the body which distributes State funding to sporting organisations, in relation to the loan. It has also written to the Office of the Director of Corporate Enforcement offering clarification on any issues raised by the loan, and said it will answer any questions. In its statement, the FAI also said it "acknowledges that we are invited to appear in front of the [committee]". But pressed on whether Mr Delaney will attend, a spokesperson said the association was not saying anything beyond what was in its statement and did not answer the direct question. A meeting in February was postponed due to Mr Delaney and other FAI figures having to attend a Uefa meeting in Switzerland. Meanwhile, an invite to members of that committee to a dinner and drinks event just six days before the hearing has been issued by the FAI. A "gentle reminder" was sent to the committee yesterday, after the invite was first extended last Friday. Committee member and Fine Gael TD Noel Rock said the timing of the invite was "badly judged" and it would be "inappropriate" for members to attend the U17 Championship draw and the accompanying dinner and drinks. Taoiseach Leo Varadkar described the loan as "unusual". "It does seem a bit unusual. A body of that size, given its operations and the funding it receives, I would have thought has banking facilities that would have provided for a loan," he said. "I know that Sport Ireland and the Oireachtas Joint Committee will want to ask questions about that as to why that came about." A letter from Sport Ireland's head John Treacy was sent to the FAI on Tuesday. Last night the FAI said it had "answered all queries raised in the letter from Mr Treacy and looks forward to his response".